Haywards Heath Town's Karly Akehurst will miss Saturday's home game against Faversham Town through suspension. Picture by Grahame Lehkyj. Haywards Heath Town will be looking to strengthen their play-off aspirations as they host Faversham Town in the Bostik South East on Saturday. The Lilywhites sit 17th in the division having taken 20 points from 22 games. Faversham have been on a miserable run of late, picking up just one win in six league games. Heath put their poor recent form behind them last Saturday. 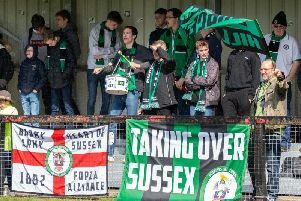 Their last gasp 2-1 away win over Sittingbourne saw them notch up their first league win in four. Saunders’ side will be looking to do a league double over the Lilywhites after picking up a 4-2 away win in October. Faversham took the lead through Ashley Miller before Andrew Dalhouse and Kieran Rowe made it 2-1 at half-time. Danny Walder levelled the score before the hour but quickfire goals from Karly Akehurst and Rowe saw Heath take the three points. The Blues will be without Akehurst for this fixture after he was shown a straight red against Sittingbourne last weekend. Hassocks travel to Saltdean United in the SCFL Premier Division hoping they can maintain their recent upturn in form. The Robins have taken six wins from eight and will be looking to continue that run against a stuttering side. Saltdean lie in sixth having amassed 43 points from 25 games. The Tigers haven’t picked up a victory since Boxing Day, although they have drawn their past two fixtures. Hassocks and Saltdean met earlier back in August, with the Tigers securing a convincing 4-1 away win over the Robins. Ben Bacon hit all four goals for the visitors, as Phil Johnson netted a consolation goal for the hosts.